Manufactured in Allemagne from Circa 1904 until after 1904. 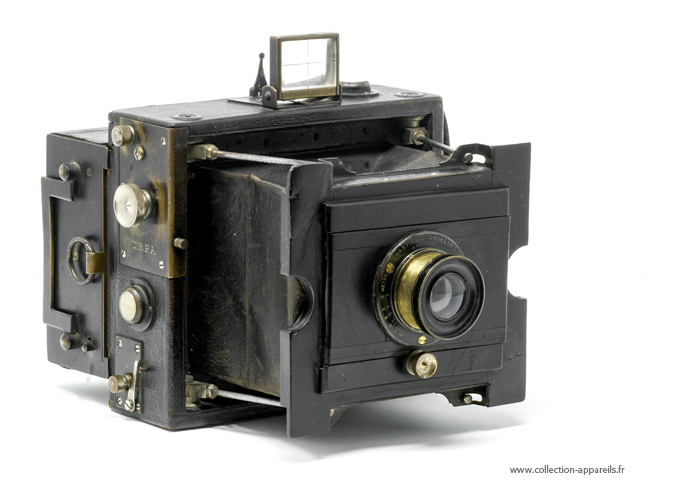 The Suter Klapp-Camera is a rebranded Mentor Klapp III made by Goltz & Breutmann. This camera was rebranded by many distributors and is the simpler version of the Mentor II. It appeared in Suter catalogues around 1904. The body is covered by black leatherette, and the front standard is made in polished wood. There is a folding optical viewfinder at the top and two bubble levels. The camera comes with a unbranded plate magazine. This camera is designed for 9 x 12 cm plates, and according to the catalogues Suter also delivered versions for 13 x 18 cm and stereo formats. The camera is fitted with a Suter Anastigmat Serie I No.1 lens, with maximum aperture of 4. The lensboard rotates allowing for vertical and horizontal shift. The Mentor focal plane shutter has no indication of speed ranges, but as in Mentor shutters of the time the maximum speed could be 1/1300 seconds, and there is no control for B or T.